Note 1: If you haven't watched either 'Lagaan' or 'Invictus', there is not much point reading this further. Maybe you can jump directly to Part II of this post. Note 2: Spoilers, Spoilers, Spoilers! Captain Russel: "Last year on your request, we took half-tax. This year, you pay us double tax." Raja Puran Singh: "But there have been no rains this year!" Captain Russel: "The British Rule does not bathe in Indian Rains, Raja Singh. Rains or no rains, we have to run this land - for your protection. Its just double tax!" Nelson Mandela: "Forgiveness liberates the soul. It removes fear. That is why it is such a powerful weapon. This is no time to celebrate petty revenge. This is the time to build our nation. Using every single brick available to us, even if that brick comes wrapped in green and gold. 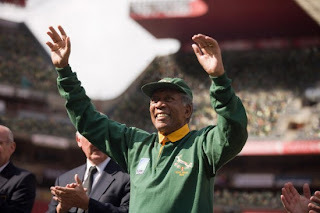 If we take away what they cherish, the 'Springboks', their national anthem, we just re-inforce the cycle of fear between us... "
Nelson Mandela [watching rugby]: "All the whites cheer for South Africa. All the blacks cheer for England." Captain Russel: "Ok. I will cancel the tax. But, on a condition. You beat us in cricket, and I will cancel your tax. But, in case you lose - triple tax ... (silence) ... I raise the bet, you beat us, and we cancel your two years' tax ... (silence) ... I raise the stakes further. You win, and I cancel taxes for the next three years, not only for Champaner, but for the entire province. Two times the tax, or, you accept the bet?" Bhuvan: "I accept your challenge..."
Nelson Mandela: "What is your philosophy on Leadership? How do you inspire your team to do their best?" Nelson Mandela: "But, how to get them to be better than they think that they can be? That is very difficult, I find. Inspiration perhaps. How do we inspire ourselves to greatness while nothing less would do. How do we inspire everyone around us? When I was invited to 1992 Olympics in Barcelona, everybody in the stadium greeted me with a song. At that time, the future, our future, seemed very bleak. But to hear that song in the voices of people from all over our planet made me proud to be a South African. It inspired me to come home and do better. It allowed me to expect more of myself. It was Nkosi Sikelel' Afrika - 'God Bless Africa'." Bhuvan: "This is an opportnity. Can you pay double tax? No. Agreed, we are weak. But, there is hope. And I want to transform this opportunity into reality. If we win, we would be prosperous. No tax for three years! That means our grains will only be ours, not anybody else. Yes, I dream. And only they who dream them, realize them. 3 months is not a short time. We can learn the game and beat them!" Villagers: "No-one would co-operate with you. You are crazy... ""
Bhuvan: "This game is not difficult. The British, with in their white uniforms, call this game cricket, and we call it gilli danda. We have been playing this game for generations!" Nelson Mandela: "Because in order to build our own nation, we must all exceed our own expectations"
Elizabeth: "I would like to help them learn the game. Because I know what happened to them is unfair, and I want to give them a fair chance..."
Minister of Sport: "According to the experts, we'll reach the quarter-finals, and no further." Nelson Mandela: "According to the experts, you and I should still be in jail." 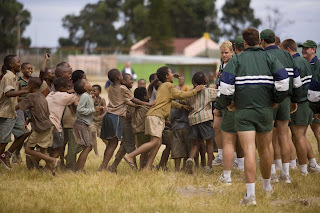 The national rugby team plays with black children. Mutual trust and respect increases. The country gets a common passion - a sport, Rugby. Villagers: "We should co-operate with Bhuvan. A British girl is helping us, while we sit idle?" Bhuvan: "This is not a game we are playing for our entertainment, this is a fight, which we have to win." Minister of Sport: "We have already exceed all expectations." Nelson Mandela: "Its not enough. Not now. Not so close. This country is hungry for greatness"
...they won, against all odds. Against all obstacles, they won! The Gods were pleased, and it rained! Two powerful pieces of cinema - 'Invictus' and 'Lagaan', about two (similar?) countries, facing similar problems. "His people needed a leader. He gave them a champion." 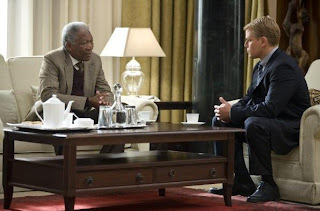 Some of the very brilliant scenes in the movie includes Mandela inviting Fracois, the captain of the rugby team, over tea, and that in which Francoise visits Mandela's prison. 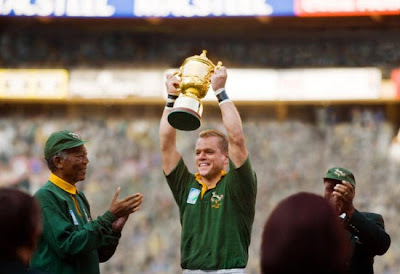 The sheer joy one gets during the final sequences in the moments, when a black child enjoys the World Cup Rugby finals with a couple of cops on the radio is indescribable. 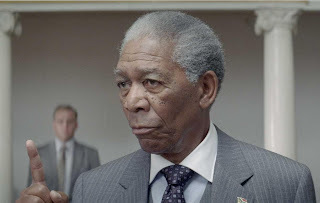 Added to it is a very powerful portrayal of Nelson Mandela by Morgan Freeman, also nominated for an Oscar this year. Having seen 'Lagaan' in a theatre myself, I can just imagine how over-whelmed the people of South Africa must be by this movie, and what the audience reactions to this movie must be in the theaters. I can hear them cheer for their National Rugby team during the movie, and re-live their Rugby World Cup victory in 1995. I can see them witnessing the change their country has undergone, and they can do that as proud South Africans. I cannot comment on whether this movie should win an Oscar or not (I have a personal list of favorites), but this is one of the movies which all of us in India should watch, make note, learn, and get inspired from. After all, the father of our nation, Mahatma Gandhi's struggle began from South Africa. will watch the movie now :) well scripted .. Comment 1. I'd very much like to see the deleted comment by Bharat. Comment 2: Nice fundae, served with a dash of spice and sento; that too as a follow-up to Love Networks... To a layman, daal poora hi kaala lag raha hai, Pulkit da!